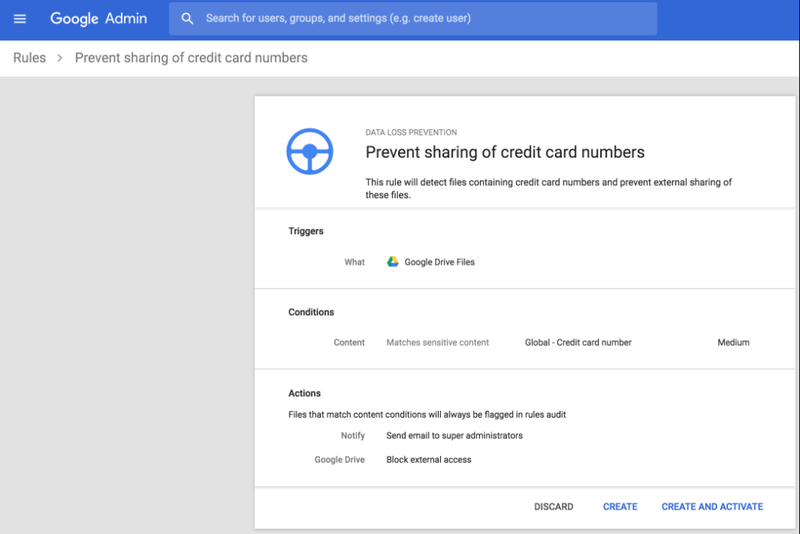 Data Loss Prevention (DLP) for Google Drive, giving G Suite Enterprise edition customers more control over how data is shared beyond their company. Today, we’re bringing DLP to content stored in Team Drives. DLP analyzes the files in your organization’s Team Drives for sensitive content. You can set up policy-based actions that will be triggered when any sensitive content is detected. G Suite admins will be able to control what content members of the team can share externally using easily configured rules and easily enforced policies. Because Team Drives are owned by the domain, rather than individuals, existing DLP rules applied at the domain level will apply to Team Drives. If a DLP rule is assigned to an organizational unit or a group, then that rule will not apply to Team Drives. When files stored in a Team Drive are flagged by DLP rules, users outside of your organization will lose access to these files. For detailed instructions on how to set up these rules and policies, visit the Help Center. Protecting your company’s confidential data is critical, regardless of where it’s stored. In January of this year, we announced Data Loss Prevention (DLP) for Google Drive, giving G Suite Enterprise edition customers more control over how data is shared beyond their company. Today, we’re bringing DLP to content stored in Team Drives.